All the best ideas I've read recently, plus some of my own. This blog will be a compendium of all the things I find interesting on the web, as well as my own opinions. It may range from aarvarks to zen, as well as including art projects of the moment and I hope it will reduce the flurry of tedious emails I have been sending of late. A couple of economists at the Federal Reserve actually did the research, and what do you know? The government policy of supporting home ownership didn’t encourage the unworthy peasants to borrow beyond their means, as the Republicans would like to tell the story today. It was actually the slimy mortgage lenders who gave undocumented mortgages to anyone who was breathing. They did it because they could sell them off to unscrupulous Wall Street investment houses. They in turn bought them because they could buy AAA ratings from the ratings agencies for the bundles they made from them. And then the Wall Street could slice and dice the bundles and sell them to unsuspecting pension funds and charitable organizations looking for safe yields to replace the bonds they could no longer invest in because they were only yielding paltry interest rates. Why? Because Alan Greenspan kept interest rates so low in the early 2000’s that charities couldn’t meet their obligations to pay out 5% of their assets and still grow with the safe investments they were used to investing in. A growing literature suggests that housing policy, embodied by the Community Reinvestment Act (CRA) and the affordable housing goals of the government sponsored enterprises, may have caused the subprime crisis. The conclusions drawn in this literature, for the most part, have been based on associations between aggregated national trends. In this paper we examine more directly whether these programs were associated with worse outcomes in the mortgage market, including delinquency rates and measures of loan quality. We rely on two empirical approaches. In the first approach, which focuses on the CRA, we conjecture that historical legacies create significant variations in the lenders that serve otherwise comparable neighborhoods. Because not all lenders are subject to the CRA, this creates a quasi-natural experiment of the CRA’s effect. We test this conjecture by examining whether neighborhoods that have been disproportionally served by CRA-covered institutions historically experienced worse outcomes. The second approach takes advantage of the fact that both the CRA and GSE goals rely on clearly defined geographic areas to determine which loans are favored by the regulations. Using a regression discontinuity approach, our tests compare the marginal areas just above and below the thresholds that define eligibility, where any effect of the CRA or GSE goals should be clearest. We find little evidence that either the CRA or the GSE goals played a significant role in the subprime crisis. Our lender tests indicate that areas disproportionately served by lenders covered by the CRA experienced lower delinquency rates and less risky lending. Similarly, the threshold tests show no evidence that either program had a significantly negative effect on outcomes. Canada is the first country to sign the Ottawa Protocol on Anti-Semitism! Fittingly, Canada is the first country to sign the Ottawa Protocol on combating antisemitism.The document was drafted in Ottawa at the November 2010 Conference on Combating Antisemitism and was signed last week by Citizenship, Immigration and Multiculturalism Minister Jason Kenney and Foreign Affairs Minister John Baird.It represents the outgrowth of a series of conferences by the Inter-Parliamentary Coalition to Combat Anti-Semitism (IC-CA), which co-hosted the Ottawa conference along with the government of Canada last year. The protocol contains a series of measures that seek to end hateful propaganda online and in places such as university campuses and distinguishes valid criticism of Israel from antisemitism. Jewish community leaders and groups hailed the government’s signing of the document last week. The Centre for Israel and Jewish Affairs (CIJA) commended the signing. In a statement, CIJA CEO Shimon Fogel called the document “groundbreaking” in its findings and recommendations. The Ottawa Protocol “will serve as the basis of the renewed international effort against antisemitism. The fact that this important document was crafted in Ottawa is further testimony to Canada’s leadership role in this vital global battle,” he said. At the signing, Kenney said Canada is fighting anti-Semitism in a number of ways. The Canadian Friends of Simon Wiesenthal Centre (FSWC) also praised the government for becoming the docu-ment’s first official signatory. In a statement, Avi Benlolo, president and CEO said his organization applauded the government’s “principled leadership” on the issue. To read the full text of the Ottawa Protocol, go to www.antisem.org/archive/ottawa-protocol-on-combating-antisemitism/. The author of “Bailout Nation”, Barry Ritholz, has it right again. His common sense solution, unfortunately, has no chance of getting done because too many vested interests are making money from the ‘new’ rules that let them get us into the crisis in the first place. But his suggestions would just do it. If only…. Best news Massachusetts has had for a while! Elizabeth Warren, a Harvard professor and former Obama administration official who became a hero to liberals with her sharp critique of the nation’s financial institutions, will announce Wednesday that she is challenging Sen. Scott Brown of Massachusetts for his seat in 2012. 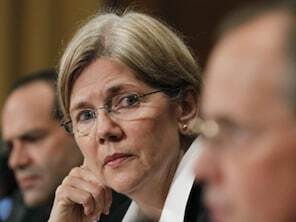 Warren, 62, had been widely expected to run and had been conducting a campaign-style listening tour. She will formally announce her intentions with an online video statement as she travels the state. Her candidacy will set up one of the nation’s most high-profile Senate races. Democrats, who are trying to hold control of the Senate, hunger for a win in one of the nation’s most liberal states, particularly if it would mean snatching back the seat once held by the late Edward M. Kennedy. Brown (R) won the seat in a 2010 special election after Kennedy’s death. WASHINGTON (The Borowitz Report) – In what the White House hailed as “an example of what can be accomplished when we put aside partisan differences,” congressional Republicans today responded to President Obama’s $447 billion American Jobs Act by allowing the President to create one part-time job. While details of what the job would entail remain to be determined, it was expected to be in the lawn work or handing-out-flyers industry. In order to secure funding for the part-time job, Mr. Obama had to cave to a series of Republican demands, including tax breaks for second homes and third wives. But even as the President and congressional Republicans announced their agreement on the part-time job plan, the proposal came under attack from GOP presidential front-runner Rick Perry, who blasted the plan for creating yet another worker who would someday be eligible for Social Security. “If we don’t cut Social Security now, we won’t have enough money to execute our children’s children,” Gov. Perry said. This is the best discussion of politics in America that I have read in years – long and covers the demise of civility in politics in the last 30-40 years. It is written by a just-retired Republican congressional staffer and is a tell-all of the inner workings of Republican strategy and why the Democrats don’t have a snowball’s chance in hell of making this country sit up and take notice. It covers politics, demographics, economics and human psychology and will make you cry if you care about this country and its future! A little light view on the crisis in Europe – thank you Barry! And now, for the proof of the pudding….. But the best part is that the Belgian economy is the envy of all Europe! Because there has been no government, there has been no austerity program put in place, as has been done in all the other Euro-zone countries – with the result that Belgium’s economy is doing BETTER than all of its peers!!!! If this doesn’t prove that government meddling in the economy – especially with austerity programs – is NOT good for the economy, then nothing will.